I’ve reflected on the Director’s Student Voice Forum…. 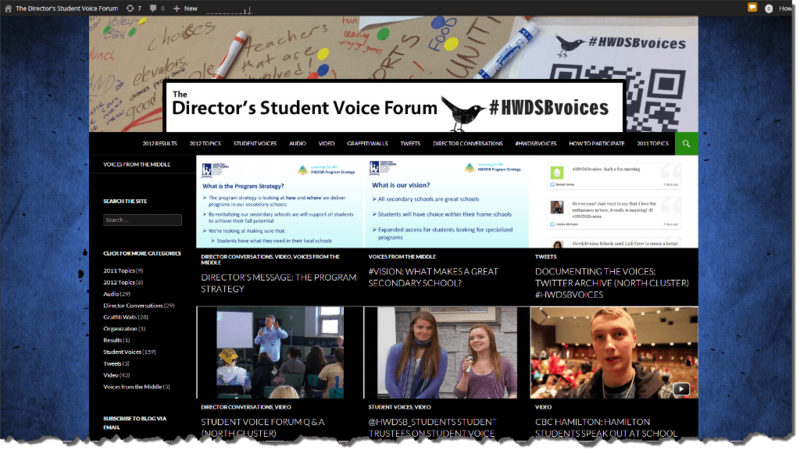 If you’ve visited the Director’s Student Voice Forum before, and if you visit it again, you’ll notice that it has taken on a new look and feel. You might ask why I would do this, or, maybe you wont. What you might not understand, though, is that this blog takes up an exponential amount of my time and energy. I love it. I’m committed to it. It’s my creation. It’s my “Space Jam”. But, I can’t stress this enough, it consumes me. The time it takes to curate, design,and maintain this blog is off the charts. I believe in my heart of hearts that this forum is absolutely vital to ensure that students have a voice beyond their schools and that they can and will be heard from afar and by those that can make change. Without this blog, students would be expressing their thoughts within the bubbles of their own school communities and lost to the greater student body of the entire board. My vision is that students will look beyond seeing themselves as a student of “——” high school and start seeing themselves as a student of @HWDSB. All students fall under the same umbrella of the board and we have the power to connect each and every one of them through digital media tools such as our @HWDSB Commons (a WordPress / Buddypress Social Learning Network). We are fortunate in @HWDSB in that we have a unique grass roots created social learning network such as the @HWDSB Commons where students can connect beyond the temporal and geographical realities of this daily learning grind. I am proud to say that I was part of creating (and primarily testing at a Secondary level) the @HWDSB Commons but need to give props here to Jared (@mrjarbenne). Without him, the @HWDSB Commons would not exist as it is today and I hope that all within @HWDSB understand that this is a vision come reality and that it gives all students an opportunity to connect, network, collaborate, and share both within their schools and beyond. The “Proof of Concept” became a reality. The awards have been given and it’s time for the platform to shine! 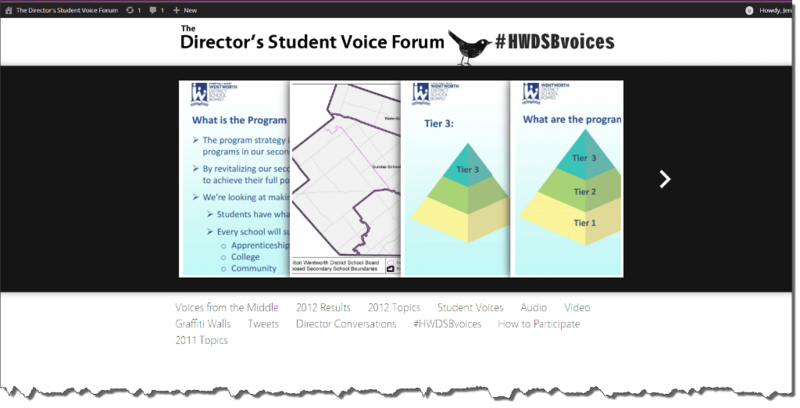 The previous incarnation of the HWDSB Director’s Student Voice Forum blog was created using a theme called Minimatica. I love that theme and I think that it highlights a portfolio blog quite well. In essence, the Student Voice blog is a portfolio of voices collected using a variety of tools and mediums (writing, blogging, video / speaker’s corner blogging, podcasting, typing, Tweets, etc. ). The blog is the curation station of the variety of disparate voices collected during the forums and separately during individual school forums (well, that’s the vision and will be made a reality this year with the 3rd annual event). I am looking to the time when I’m am not the gatekeeper of the Director’s Student Voice Forum blog. I am looking to a time when I leave this position and, hopefully, become a Vice-Principal of a school. At that point in time I will not be the one to maintain and curate such a blog and aggregate all of the voices from the variety of platforms available. To date, this has been my passion, my dream, my “Space Jam”. To ensure it’s legacy I need to build the capacity of others to not only perpetuate the blog itself but ensure that students are provisioned with the opportunity to express themselves their way through whichever tool or medium they choose. The Minimatica theme is quite complex to maintain and, perhaps, not as user friendly as it could be. The update to WordPress version 3.8 brought with it a pretty slick theme called Twenty Fourteen. I haven’t been a huge fan of the default WordPress themes over the years (twenty ten, twenty twelve, twenty thirteen, etc.) but have been personally drawn to magazine style themes, of which this blog (Bloggucation) is one such example (Yamidoo Pro). Seeing as the Twenty Fourteen theme is default to WordPress I was thinking that it may be the exemplar to move to next. A theme that would showcase the student voice artifacts collected thus far and that would highlight those to come this year and beyond. I was also looking for a theme that would be beautiful on a mobile device and that would be as responsive as possible. But, first and foremost, and this goes way beyond my comfort zone, I’m preparing for the future where the Director’s Student Voice Forum blog will have multiple authors way beyond me. The community will create, curate, and maintain the blog without a webmaster…without a “me” to ensure it looks beautiful and easy to navigate. I believe that the Twenty Fourteen theme will allow that ease and flexibility of use where multiple student authors will both create posts and respond to the posts of others. This space is an area for students and student voice to shine and the creation of posts needs to be as easy as possible. A default theme is always a good choice. I believe and this new design (not only looks stellar in my humble opinion) but is super easy to contribute to, categorize, and tag. To date, I have been the sole author of the Director’s Student Voice Forum blog and students have been commenting and replying to the topics that we post. It was a start. This year, however, we are moving to an era where students generate the ideas they would like to discuss and they will become the authors of their own posts. to do this, they will join the Director’s Forum group and automatically become authors to the blog upon joining. They will co-create with other students in the board, network, and comment among each other. From this point forward, student voice will become embedded in school and classroom culture and the Director’s Student Voice Forum blog will be the place where those voice are collected and curated. This year we will unleash creativity and student voice in an intelligent and responsive system. Let’s see where it goes…..